The closest substitute for outdoor grilling, logically enough, is often indoor grilling. Many high-end ranges offer a built-in stovetop grill, with a powerful downdraft vent to whisk away the acrid clouds of smoke your steak generates. For those with less-exalted appliance budgets, a heavy cast-iron grill pan can also turn out a delicious steak. 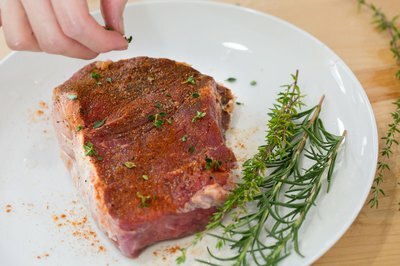 Season your steaks with a spice rub, marinade or coarse salt at least an hour ahead of time, or simply salt them at the last minute before grilling. Trim any excess fat from the edges of your steak, leaving a thin rind of no more than 1/4 inch. A small amount of dripping fat gives your steak a pleasantly smoky flavor, like an outdoor grill, but too much will create excessive smoke and raises the risk of dangerous flare-ups. Preheat your grill on high for at least 5 minutes to heat its bars to a searing temperature. That way they'll be hot enough to make attractive grill marks on your steak. Brush or spray your steaks with vegetable oil, which has the dual benefit of helping them brown and keeping them from sticking to the grill. Place your steaks on the grill, spacing them evenly so there's plenty of room for air to circulate. Turn your stove's downdraft venting to high to capture the smoke from grilling the steak. 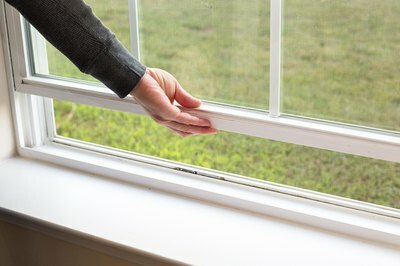 Turn on your range hood as well, and -- especially if you're grilling rib eye or another richly marbled steak -- you might also wish to open a window or two. Billowing clouds of smoke are part of the appeal with outdoor grilling, but like a large, wet dog, they're less welcome indoors. Grill your steaks for 7 to 12 minutes per side, depending on their cut and thickness, until they reach your preferred level of doneness. Steaks 1 inch thick or less fall at the shorter end of that scale, while steaks 1 1/2 inches or more fall at the longer end. If you experience flare-ups during cooking, use long tongs to slide the steak away from the flame. 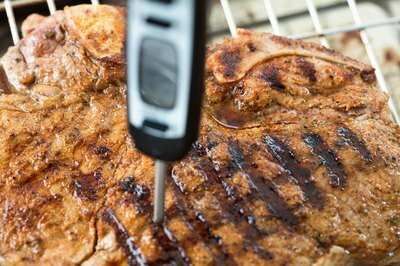 Test your steak by inserting an instant-read thermometer horizontally into a thick section of muscle. 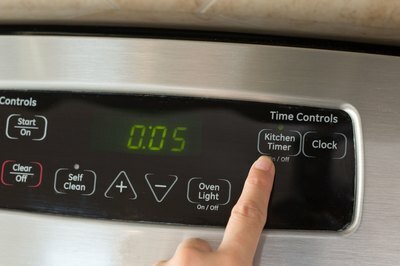 For rare, you want a temperature of 120 to 125 degrees Fahrenheit, for medium-rare 125 to 130 F and for medium 130 to 135 F. Thick steaks will continue to cook after you take them from the grill, so aim for a temperature 5 degrees below your target. • Thick steaks benefit from 5 minutes of resting time after they come off the grill, as they finish coming up to their final temperature. Rest them on a preheated plate or serving platter, under a loose covering of aluminum foil. 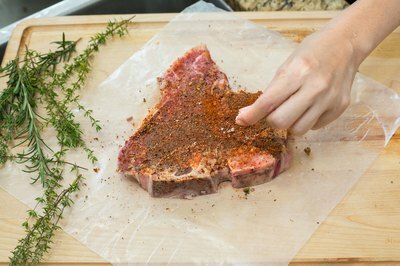 Thin steaks cool too quickly for resting time to be a factor, and can be served immediately. 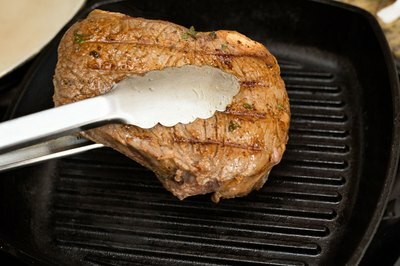 • To make attractive restaurant-style cross-hatched grill marks, start your steaks at a diagonal to the grill's bars. Midway through cooking the first side, rotate them 60 to 90 degrees to create the intersecting marks. Warning: If a flare-up lasts for several seconds, turn off the grill's burners and wait for it to subside. If necessary, sprinkle the flames with salt or baking soda to smother them. 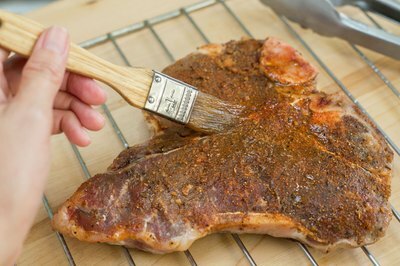 Pre-season the steaks with a spice rub or marinade that suits your taste, or simply salt them generously an hour or so ahead of time. Place a square or round grill pan over a large burner on your stovetop, or position a larger rectangular grill pan over two burners. Preheat the grill pan over medium-high burners until it's very hot. If the pan is well-seasoned, it may begin to emit thin wisps of grey, strong-smelling smoke. 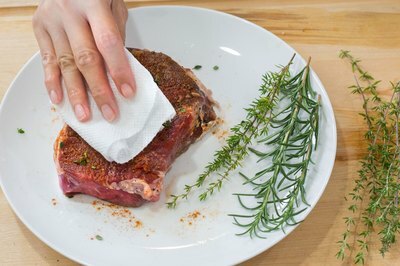 Blot any surface moisture from your steaks with paper towels, then brush or spray the steaks lightly with oil to encourage browning. Lay your steaks into the grill pan, spacing them so they aren't crowded. If you're using a two-burner grill pan, avoid the middle area between burners, which tends to be cooler. Instead, position your steaks directly over the burners. Pan-grill your steaks for 5 to 8 minutes per side if they're 3/4 inch to 1 inch in thickness. 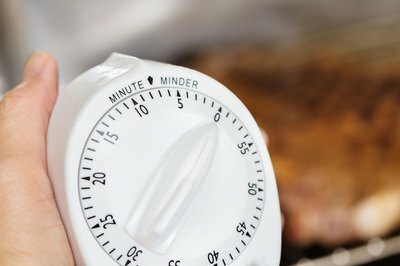 Steaks 1 to 1 1/2 inch might require as long as 12 to 15 minutes per side, depending how done you like your beef. Pour off any excess fat, or spoon it away with a small spoon, if it threatens to overflow from the pan's grooves at any point. 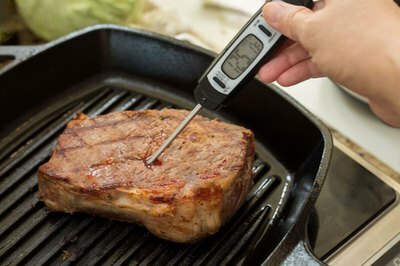 Test your steaks for doneness with an instant-read thermometer, sliding it horizontally into a thick section of muscle. The final temperature should fall into the range of 120 to 125 degrees Fahrenheit for rare, 125 to 130 F for medium-rare and 130 to 135 F for medium. 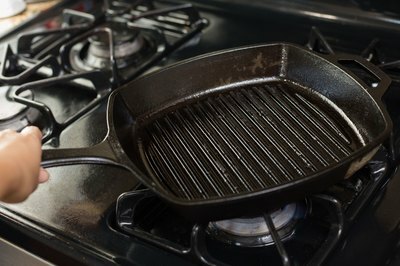 • The ridges and grooves of a grill pan simulate grill marks and provide opportunity for fat to drip away, as a real grill does, but won't provide the hint of smoke that distinguishes genuine grilled steaks. To compensate for that, you might wish to use a spice rub containing smoked paprika or chipotle chilies, or incorporate a liquid smoke seasoning into your marinade. 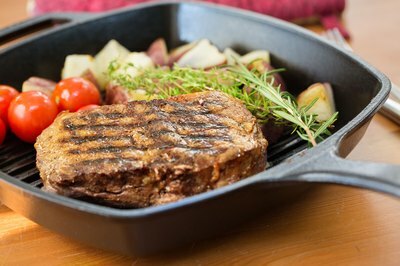 • Grilling pans' ridges don't transfer as much heat to your steak as a flat skillet, and are best suited for cooking thinner steaks of 3/4 inch to 1 inch. For thicker steaks, it's often better to sear them on your stovetop grill pan for appearances' sake, then transfer the steaks to a 450 F oven to finish cooking.